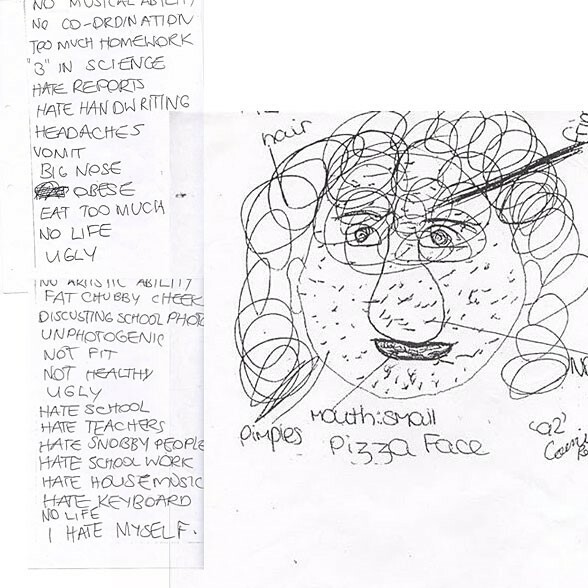 This was the description of Rachel Barber, written in the diary of her obsessed killer, Caroline Robertson, five years her senior. Her parents described Rachel as elegant, charismatic, showy and innocent. A blossoming fifteen year old, Rachel left school to pursue her passion for dancing. 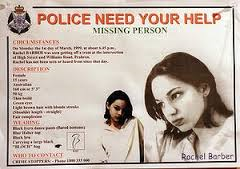 On the day of her disappearance Rachel told her boyfriend, Mannie, she was meeting an old female friend who had a job for her. Rachel showed Mannie the spice girl platform shoes she wanted, and said she would be able to buy them with the ‘heap of money’ she would make that night. Caroline had on occasion babysat Rachel and her sisters and used to live across the road from the Barbers. Caroline’s diary revealed a jealous, insecure, girl who planned on taking over Rachel’s identity. Caroline had phoned the Barbers some weeks earlier to find out the dates of birth of the family members. She spoke with one of Rachel’s sisters. Documents found at Caroline’s unit, showed she intended to adopt the name ‘Jem Southall’. She even went to the extent of composing a short personal history of Jem Southall, which contained fictitious details of the parents of the new persona. Southhall was Rachel’s mother Elizabeth’s, maiden name and Jem was an unrelated first name. She wrote, ‘Jem Southall – 16 years – total revhead’. Caroline had written down her strategy to lure Rachel with an offer of money to take part in a fake psychology study, then drug her, disfigure her and dispose of her body. When Rachel did not meet her father as arranged, her family began to worry. Rachel loved being at home, never had sleepovers and was very close to her family. Her parents knew immediately something was wrong, she was not a runaway like the police treated her case. Initially many doors were slammed in their faces, so Rachel’s family began their own search for their daughter. They put up flyers everywhere, door knocked and contacted everyone they could think of who knew Rachel. They had to fight for the police take their concerns for their daughter seriously. On 28 February 1999, Caroline met Rachel at Richmond train station, Melbourne and together they bought a pizza, before returning to Caroline’s flat in Prahran. Caroline tried to ply Rachel with alcohol but was not successful as Rachel was not interested. Some time in the night, that remains unknown, Rachel was strangled with a telephone cord. Her body was kept in the wardrobe for three days, before she was buried in a shallow grave. Caroline hired a van and drove to her father’s property in Kilmore and buried Rachel in a shallow grave. She still had the cord around her neck, when her body was found two weeks later. Caroline was sentenced to twenty years for pleading guilty, with a non-parole period of fourteen and a half years. In his sentencing remarks on November 29, 2000, Justice Frank Vincent said ‘Robertson had been motivated to kill Ms Barber by envy of her for her family, her beauty and her personality and … because you believed that she would be likely to have a happy and successful life of a kind that you anticipated you would never experience’. Caroline Reed Robertson will be released in January 2015, after spending nearly fifteen years in Deer Park Prison, in Victoria. Rachel’s boyfriend Mannie Carella, 31, said he thought about Rachel every day and has had anxiety attacks at the thought of Caroline being released. Elizabeth Barber said she did not begrudge Caroline happiness on the outside, but remains fearful she would reoffend. Elizabeth said ‘If she is expressing concerns for her mental health before she is released on parole, what level of rehabilitation does the Adult Parole Board of Victoria deem adequate for her not to be a risk to our community? Caroline has said she is concerned for her family and is upset they have been threatened and have had to move house. Caroline mentions the book co-authored by Elizabeth Barber,called ‘Perfect Victim’ and the film, ‘I Am You, which tell this harrowing story. Elizabeth said ‘Rachel lost her life because of Caroline’s crime. It is not only Caroline’s family who have suffered because of her crime, primarily it is Rachel and her/our family. Caroline will be 35 when she is released from prison, and by all accounts has been a model prisoner. Rachel and her family had moved from the country, as there was more opportunity for Rachel to progress with her dancing. Sadly her life was cut short in a malevolent act. Conclusion – Caroline was released in January 2015 and remains free today. Your blog is great and your style is very on-point, but I wish you would update more frequently. If that’s not possible for you, consider taking on a cowriter to share the load and allow your audience to see more content from you guys? Just a thought.